3 WEEK INTERSTATE HIWAY CLOSURE STATE & PUGET SOUND TRANSPORTATION NIGHTMARE. WHY THE MADNESS? WHY NO LEADERSHIP? Hello. 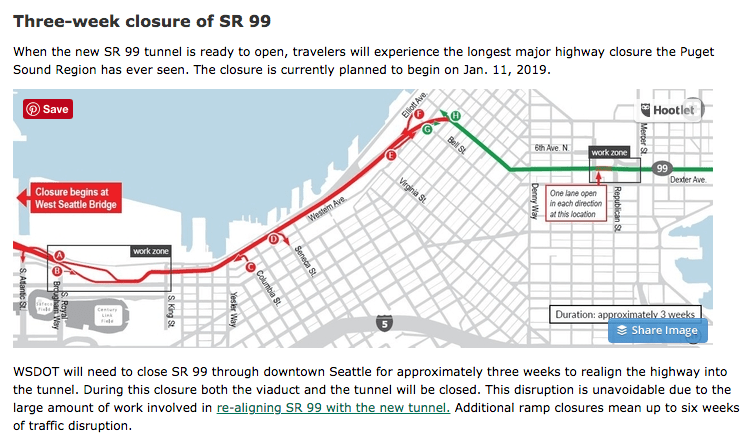 You may or may not have seen the friendly reminder emails that state of Washington plans to CLOSE DOWN a major north-south interstate hiway 99 in the middle of Seattle for (a minimum) of 3 weeks in January 2019 (the middle of the winter) while they tear down the viaduct and open the new toll tunnel. What is truly astonishing is that there is absolutely NO help from any government agency to help emergency providers, citizens, business and transporters that drive through this state, the Puget Sound region and the City of Seattle except periodic friendly reminders and a sad list of homey tips- if you happen to subscribe to email from WSDOT-Seattle Area Traffic News..
Where the hell is leadership and resources to get this state’s residents through 3+ week closure Hiway 99 viadict? INTERSTATE HIWAY 99 carries 100,000 cars a day. IT’S beyoe APPALLING. NO PLANS NOR no BUDGET FOR ADDITIONAL TRANSPORTATIOM MEASURES HAVE EVEN BEEN DISCUSSED. This is it folks: http://www.wsdot.wa.gov/Projects/Viaduct/realign99 . See below for the list of friendly suggestions for geting through this traffic nightmare. And they promise ONLY 3 weeks? Really. Hmmm. Where are the EXTRA BUSES that should have been brought into the region, staffed and ready to go along with the extra service and additional routes before this closure is put in place? NOTHING has been done. EXTRA TRAINS? NOPE. What’ coordination has been done with major employers to handle commuting traffic? Has the state/region/city reached out to small and medium business? How will this KILL business even further. How about small service providers. How do working mom’s get to daycare before they close? (Editor’s Note: although mom’s definitely have the toughest job in the world, ALL parents’s and citizen’s needs should be met). What’s the EMERGENCY PLAN? What if we have THE earthquake?